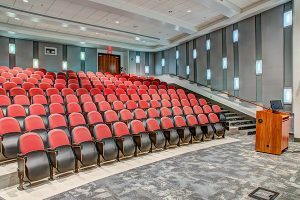 Provided mechanical, electrical, and plumbing engineering for renovations and additions to a classroom building for a collegiate school of business. In total, 22,000 sq. ft. were renovated and a 34,000 sq. ft., five-story addition constructed to house nine new smart classrooms with seating for 40 each, conference rooms, labs for students enrolled in finance and operations management courses, 150-seat lecture hall, and a 200-seat multipurpose room with serving kitchen.